President George W Bush made quite a few trips to Florida in 2004. 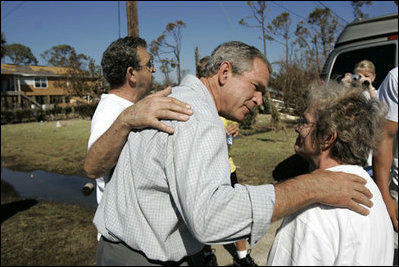 President Bush spends time with local residents during a walking tour of hurricane damage in Pensacola, Sept. 19, 2004. He was, after all, running for reelection. But on September 19, he joined Governor Bob Riley of Alabama and his brother, Governor Jeb Bush of Florida to see firsthand some of the damage done by Hurricane Ivan. There was a lot to see. The damage from Ivan totaled almost 19 billion dollars, making it the sixth most expensive storm in US history. And in the days immediately after the storm, how some of that money needed to be spent became apparent. On September 17, 2004, about 36 hours after Ivan hit the Gulf Coast, Escambia County Administrator George Touart talked about some of the quick work being done already to recover from the storm. He praised the Florida Department of Transportation for already assigning a contract to repair the I-10 bridge over Escambia Bay, hoping to get at least one span of the bridge open to two way traffic within thirty days, calling it an "unbelievable task" given the amount of damage done to the span. He also said the Bob Sikes Bridge was getting a temporary entry ramp to equipment could be brought out to Pensacola Beach for restoration work. There was not a single aspect of life in western Florida that was not disrupted by Hurricane Ivan. The water supply, sewage treatment, fuel, food, transportation, power...everything that most of us take for granted was either gone or compromised by the storm. But once the shock from the storm passed, the recovery began. John Hutchinson, a spokesman for Gulf Power, said power crews from up and down the eastern seaboard were in the region working to get the lights back on. The utility lost 87 substations to the storm. Four days later only 12 substations were still off line. And of the 790 miles of transmission lines that were ripped down by Ivan, all but 100 miles had been restored. It would be 13 days before all of Gulf Power's customers would have their power restored. But that would not be the end of an extremely busy September for power company employees. On September 26 Hurricane Jeanne made ground in Stuart, Florida...in just about exactly the spot that Francis did just 3 weeks earlier. One of the biggest disruptions to day to day life involved the schools, which were either damaged or used as emergency shelters in the days after the storm. On September 21, Steve Sharp, the Director of Security for the Escambia County School district reported 18 million dollars of uninsured damages to the county's schools and equipment. That was in addition to the 80 to 100 million dollar estimate of the district's insured losses. Classes would not resume in Escambia and Santa Rosa Counties until October 11. One of the most iconic images from Hurricane Ivan is the picture of a truck sitting askew on the I-10 bridge with massive chuck of the bridge washed away into the bay. On October 5, just 17 days later, Governor Jeb Bush was in town for the reopening of one span of that bridge to two-way traffic, saying it was a project done with "ingenuity and teamwork". In early 2006, construction began on a replacement to the I-10 bridge over Escambia Bay. It officially opened to traffic in December, 2007. And the new bridge is not the only enduring after effect of Ivan. The storm changed the landscape and skyline of Pensacola...and many things from a new wastewater treatment plant to the Pensacola Blue Wahoos baseball team can be traced back to Hurricane Ivan. One thing we know for certain...there will never be another Hurricane Ivan. In the spring of 2005, the name Ivan was retired by the World Meteorological Organization and will never be used again in the Atlantic Basin. In 2004, Hurricane Charlie hit the state of Florida at Fort Myers on August 13. Hurricane Francis struck the east coast near Stuart on September 5. That was the same day that Ivan went from a tropical storm to a hurricane. 18 hours later it was a category 4 storm and still strengthening. Hurricane Ivan 14 Years Later - Ivan Strikes! On the morning of September 16, 2004, Hurricane Ivan was no longer a local story. NPR led its newscasts that morning with updates about the storm damage and loss of life. Earlier, at 1:50am, Hurricane Ivan made landfall at Gulf Shores, Alabama. By then it had already killed 67 people in the Caribbean including 39 in Grenada and 17 in Jamaica. Escambia County was hit by the eastern edge of the storm, the most dangerous part of any Atlantic hurricane. Ten years ago, Hurricane Ivan brought widespread destruction to the region. In Northwest Florida, Escambia and Santa Rosa counties were closest to the eye and suffered the most damage. As part of WUWF’s 10th anniversary series, Danielle Freeman has this look at the storm’s impact on Okaloosa County. As part of WUWF’s look back at Hurricane Ivan on its 10th anniversary, it turns out the storm did lead the way towards replacing Pensacola’s water treatment plant, which had been in service since 1937. Ivan’s 100-plus mile and hour winds and storm surges of up to 15 feet mortally wounded the Main Street Treatment plant. A power outage knocked it off line for three and a half days -- resulting in a toxic brew of storm water, storm surge and raw sewage flooding parts of downtown Pensacola.